You can research polices without providing personal information. We conduct our business in a low-pressure environment. Our agents are here to assist you, not sell to you. Our process is the quickest and most efficient possible. We’ve improved upon it for years to ensure there’s no wasted time during the underwriting process. We can get you the lowest-cost policy from among the top-rated companies. How? We’re an independent agent contracted with all of the top life insurance carriers. You never have to meet with an agent. We provide instant quotes from top carriers. And, we don’t ask for your name and contact information just to provide you with a quote. We supply a general health class questionnaire to help choose your health class rating. The personal information you provide on our site is protected with up to 256-bit Secure Sockets Layer encryption. You can rest assured that we will never, ever sell or distribute your information to anyone. 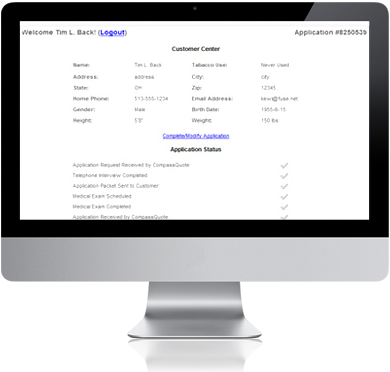 We provide weekly application status updates. If the insurance company requires any additional information, an alert is sent immediately to avoid delays in underwriting. You can log in to our website at any time to view your case status. We have no bias toward any specific insurance company. We only quote rates that are fully guaranteed for the full term of the policy.